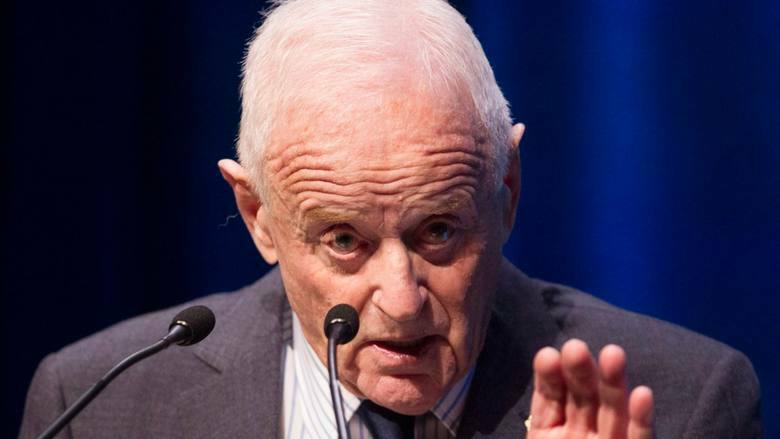 Canadian entrepreneur and philanthropist Peter Munk, who founded Barrick Gold and built it into the world’s biggest gold-mining company, has died at the age of 90. “Munk passed away peacefully in Toronto today, surrounded by his family,” Barrick said in a release. Munk was born in Budapest in 1927 and moved to Toronto 20 years later. He founded numerous businesses after moving to Canada, including a furniture and electronics business, a hotel chain and several real estate ventures. Then in 1983 Munk founded Barrick, starting with a tiny mine that produced about 3,000 ounces of gold in its first year of operation. Then in 1986, he bought an underperforming mine in Nevada called Goldstrike, which was producing 40,000 ounces of gold per year at the time. Munk believed in its potential so he bet on it big — and won. Since that acquisition, the mine has produced 42 million ounces of gold for the company, and still cranks out more than one million every year. In 2006, Barrick officially became the world’s largest gold miner after a $10 billion acquisition of rival Placer Dome. Munk differentiated himself from other mining companies by coming to the industry with a financial perspective, not the geological or engineering backgrounds from which many companies in the industry view the world. A good deal of credit for Barrick’s successes over the years has come from its gold hedging strategy, which in retrospect made the company better able to withstand the ups and down of fickle gold prices by ensuring a continuous flow of revenue even in lean years. But there were some misses along the way, too. In 2011, Barrick paid $7.3 billion to buy Equinox, which ran a copper and gold mine in Zambia. That deal proved to be a mistake, and less than two years later Barrick wrote down the value of those acquired assets by more than half of the initial price tag. Another big $8.5 billion bet on a gold and silver mine in the Andes proved similarly foolhardy once commodity prices collapsed. In later years, as the stock sagged, the company raised the ire of its own investors, who took issue with some of the company’s executive compensation pacakges. As the company grew, it also faced criticism from opponents who said Barrick’s mines around the world had shoddy labour and environmental standards. But Munk was unapologetic, and held fast in his convictions that the company was overall a source of good as part of a globalized world of capitalism. “Someone has got to create and generate wealth,” Munk said at his last annual general meeting in 2014. Former CBC business reporter and author Fred Langan, who followed Munk’s career, recalled meeting him at a news conference at the Royal York hotel in Toronto years ago, when Munk said running a gold mine was a boring business. “You take stuff out of the ground, grind it up and put a little something in there and all of a sudden you have gold. You have to do deals, you sometimes are operating in countries that might have an iffy political situation and then you as the gold miner might get accused of doing something environmentally unfriendly,” Langan described Munk as saying. In his later years, his focus turned to philanthropy, donating $300 million to numerous causes, most notably in a $100 million gift to found the Peter Munk Cardiac Centre at the Toronto General Hospital in 1997. It remains the largest single gift ever donated to a Canadian hospital. Dr. Barry Rubin, medical director at the centre that bears Munk’s name, said the philanthropist was frequently stopped on the street by people who wanted to thank him for his role in saving their loved ones’ lives through the ground-breaking medical research he funded. “I will miss his wisdom, guidance, charm and wit, and the way in which he treated everyone he met with dignity and respect,” Rubin said. He also funded the Munk School of Global Affairs at the University of Toronto with $51 million over the years, something the school’s former director Stephen Toope says was born of Munk’s belief that Canadians embodied values like openness and integrity, two things the world needed more of. “The creation of the Munk School of Global Affairs was Peter’s effort to take those Canadian values, and to help train generations of leaders to promote them on the world stage,” Toope said. Langan added Munk will be remembered more for his philanthropy than his businesses.